Since an object which is rotating also has the ability to move another object, it, too, must have kinetic energy. 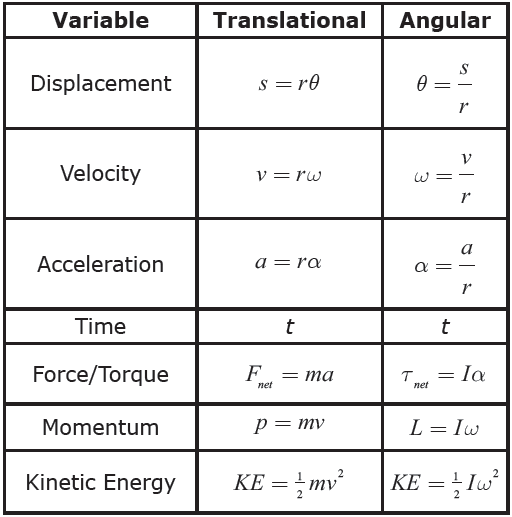 Rotational kinetic energy can be calculated using the analog to the translational kinetic energy formula -- all you have to do is replace inertial mass with moment of inertia, and translational velocity with angular velocity! Because you’re solving for energy, of course the answers will have units of Joules. Question: Gina rolls a bowling ball of mass 7 kg and radius 10.9 cm down a lane with a velocity of 6 m/s. Find the rotational kinetic energy of the bowling ball, assuming it does not slip. Answer: To find the rotational kinetic energy of the bowling ball, you need to know its moment of inertia and its angular velocity. Assume the bowling ball is a solid sphere to find its moment of inertia. Next, find the ball’s angular velocity. Finally, solve for the rotational kinetic energy of the bowling ball. Question: Find the total kinetic energy of the bowling ball from the previous problem. Answer: The total kinetic energy is the sum of the translational kinetic energy and the rotational kinetic energy of the bowling ball. 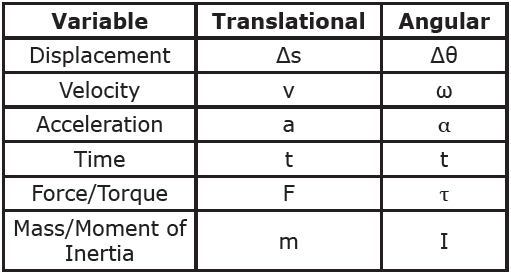 Putting all this information together, rotational physics mirrors translational physics in terms of both variables and formulas. These equivalencies and relationships are summarized below.